Have you ever received an AutoCAD DWG file from someone and needed to view, collaborate, markup or print it, but you didn’t have AutoCAD or a proprietary viewer installed on your computer? Simply convert it to PDF or image and print it without AutoCAD even being installed on your system. Sometimes there's a need to convert a DWG to PDF, batch convert DWG to JPG, print DWG files without AutoCAD or any extra software installed. You can convert or print AutoCAD, MathCAD or Solid Edge drawings one by one by yourself... or set up their printing or conversion to PDF or images automatically using FolderMill. Why convert DWG to PDF or images? Why automate printing of CAD files? With FolderMill, you can convert DWG and DXF drawings without any CAD software. The program can automatically process — convert or print files — without the need to have any CAD software installed, such as Autodesk AutoCAD or eDrawings Viewer. You can combine different actions together for one Hot Folder and set a sequence of actions, e.g. Actions can be combined in different ways and assigned to different Hot Folders. When the Hot Folders are configured, you just drop new file into the Incoming folder. The program will process them automatically and give you the resultant files in the Output folder or will send them to the right printer. 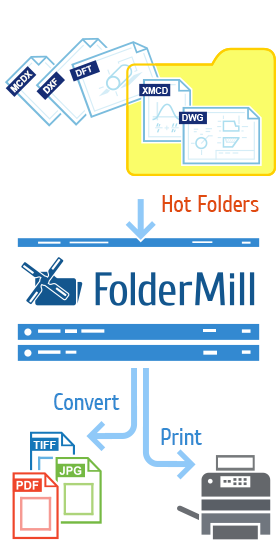 FolderMill can make the printing process fully automated and user-unattended. There's a wide range of settings available, e.g. you can configure to print CAD drawings in black and white mode only. FolderMill can automate printing of DWG, DXF and other CAD drawings. You can configure FolderMill to filter files by paper size. It will send them to a certain printer, so that your drawings will be printed on the right printing device. In addition, you can let FolderMill automatically select the best paper tray, depending on page size of each incoming drawing. Today, the process of drafting have largely been simplified through the use of computer-aided design systems (CAD / CAE / CAM). Engineers, drafting technicians and other professionals sometimes need to convert or batch print drawings. Once a CAD file is converted into PDF or image, it gets difficult to edit it. That's why PDF or image files are commonly used when submitting a drawing for approval or when making a printed copy. DWG, DXF, DFT, XMCD files can only be opened with specific CAD programs. If you only need to view a CAD drawing and don’t need to edit the file, it may be just easier to convert the DWG into a PDF file or image. By converting your DWG files into PDF or JPEG / PNG / TIFF, you can open the file with any standard file viewer (even your web browser will do). It’s important to keep the highest image quality of these files preserving every detail. If you print files occasionally, there's no problem printing them one by one. But if you or your colleagues have multiple drawings to print in bulk every day, FolderMill can become your time saver. With once configured FolderMill, all you have to do is just copy new files to a folder, and they will be instantly printed on one or many printers. You can specify the right paper tray as well. AutoCAD’s native file type is DWG, a proprietary file format created by Autodesk. DWG (from drawing) is a binary file format used for storing 2D and 3D design data and metadata. It is the native format for several CAD packages such as DraftSight, AutoCAD, IntelliCAD, Caddie and Open Design Alliance compliant applications. In addition, DWG is supported non-natively by many other CAD applications. AutoCAD DXF (Drawing Interchange Format, or Drawing Exchange Format) is a CAD data file format developed by Autodesk for enabling data interoperability between AutoCAD and other programs. According to Autodesk, the DXF format is a tagged data representation of all the information contained in an AutoCAD drawing file. Virtually all user-specified information in a drawing file can be represented in DXF format.